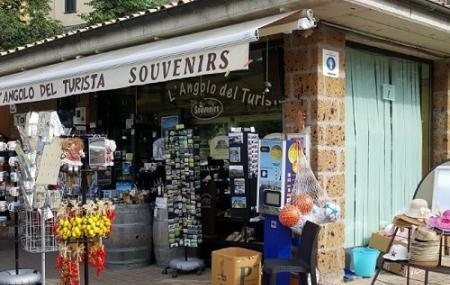 Find hotel near L'angolo Del Turista Di B ..
A quaint corner shop in Bagnoregio VT, the L'angolo Del Turista Di Biscetti Andrea is a great stop to get yourselves some souvenirs while returning home. You can purchase anything here; from stunning local pottery/ceramics to glassware. You can also avail bed and breakfast services from the authorities here. The shop is surrounded by a parking lot. Make your visit suitable to your interest, use Bagnoregio trip planner for personalization. Your worry of where to stay in Bagnoregio is sufficed by bunch of interesting and comfortable lodging options in the Bagnoregio like Hotel Oasi Dei Discepoli, Hotel Filippeschi, Hotel Duomo and Hotel Palazzo Piccolomini. Explore the best Bagnoregio vacation packages that will take to you important landmarks of the city! For getting in, check out how to reach Bagnoregio. Love this? Explore the entire list of places to visit in Bagnoregio before you plan your trip. Fancy a good night's sleep after a tiring day? Check out where to stay in Bagnoregio and book an accommodation of your choice. Andrea il proprietario super per le indicazioni e prodotti che vende ,un vero angolo del turista ,complimenti a tutto lo staff. Souvenir di Civita e tanto altro!